Ready to learn all about drawing lips? Let’s go! First, draw in the middle line between the two lips. Remember to add a slight curve to this line, because the mouth is sitting on the rounded structure of the skull and the teeth sit below it. Add a little bump in the middle of the upper lip just like in the example image above. If you look closely at your own lips in the mirror, you will probably notice this same little bump on the bottom of the upper lip, right in the middle. Begin drawing lips by adding in two large ovals to form the lower lip. Then, draw a circle in the middle of the upper lips and add in another two thinner ovals on both sides of the upper lip. This will give you a good base to begin drawing the lips from. Add some additional guidelines to the middle of the circle that you drew on the upper lip to create a rounded heart shape. 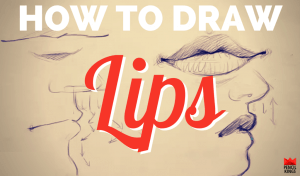 These guides will give you everything you need to start drawing in the outer edges of the lips. In this example. you can see a line has started to be drawn on the upper lip, running from the corner of the mouth towards the heart shape in the middle. Finish drawing the lines that will form the outside edge of the lips. 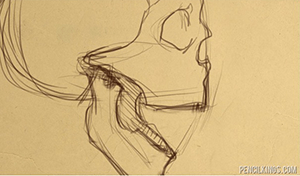 When you are drawing in the lower lip, make sure to include the slight indentation right at the middle. This indent should form naturally between the two guide ovals that you drew to create the lower lip. The middle part of the upper lip sticks outward, and the same underlying oval shapes that you used to make the front view of the lips can be used here again as your guidelines. When learning about drawing lips, try and think of these ovals as little inflated round balloons with real depth to them. 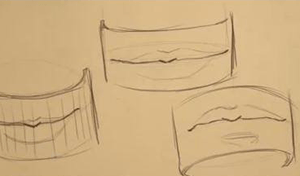 front and side view drawings of the lips. Here’s another example of the lips, but this time the oval guide lines have been made bigger to give the lips a thicker appearance. Also notice how the upper lip naturally forms an “M” shape that has been stretched out and smoothed on both the top and bottom part of the upper lip. 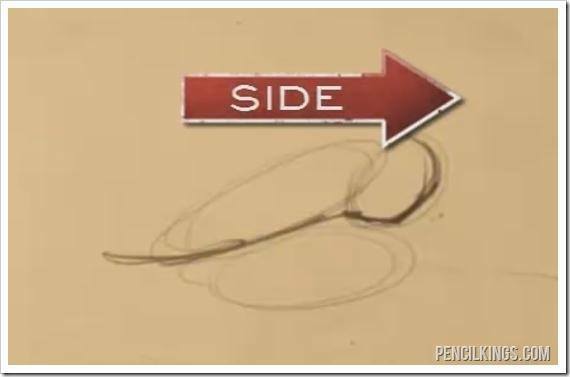 Though it may seem quite simple to think of the upper lip as an “M” it just might be the visual that you need to keep in mind to help you easily understand exactly what you are trying to draw. Even when you are drawing thin lips the same guidelines and rules still apply. First create your middle line which is curved around the teeth, and then go in and start to add the guide ovals to draw the upper and lower lips. Finally connect everything together with a defining line along the top and bottom lip to finish them off. And that, it – you’re done! In the next lesson on drawing lips, you’ll learn about the differences between the male and female lips and how to draw each of them. Learn the main differences between male and female mouths to help you draw all kinds of different characters and portraits. You’ll be amazed at how easy it becomes to draw the mouth once you understand the curved structure that lies beneath. Learn how to draw an open mouth and jaw to create an endless range of expressions for your characters and portraits.